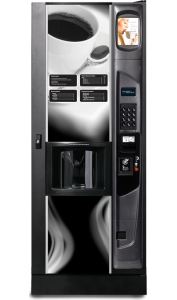 Lowest price and 0% down on coffee, espresso, cappuccino and hot chocolate vending machines. Coffee shop quality with 36 different combinations. Available in either instant or fresh brew coffee configuration. Choose from coffee, espresso, cappuccino, café late, hot chocolate, soup or tea. European designed fresh brew model will brew coffee comparable to finest coffee available in coffee specialty restaurants.